Coming to rest at the place of arguably his greatest victory, it’s the dignified, dogged and melancholy countenance of Sioux Chief Crazy Horse – one of George Armstrong Custer’s worst, and last, nightmares – that quietly threatens from the small 1877 tintype, say historical experts who offer evidence they assert proves the mysterious portrait to be the only known likeness of the famed warrior-chief. “We believe, frankly, that we’ve proven it’s Crazy Horse,” says the tintype’s owner, James (Putt) Thompson, chief curator of the Custer Battlefield Museum at Garryowen, who purchased it about a year ago and has received collaborating support from modern technology and the tenacious historical legwork of an Italian immigrant, as well as from an evidentiary path of the tintype’s origins. While the original tintype of the long-disputed photograph will be on loan for museum display, the mysterious controversy over whether it really is Crazy Horse after an earlier historical presumption that the chief never allowed his picture to be taken undoubtedly will continue to cloak it. “Mystery breeds out here at the battlefield,” chuckles Thompson, in reference to the countless Custer theories, legends and myths that abound from the world’s probably most discussed and second-guessed battle. Pietro Abiuso, a 47-year-old Italian who came to America at age 23 and has spent another 23 years researching Crazy Horse, believes he has nailed down a number of important details from original historical archival sources to prove the chief posed for the rare photograph shortly before he was murdered by Army hands. “From top to bottom, I’ve got all the descriptions, from bottom to top,” he emphasizes. The Long Island, N.Y., man also is philosophical. “My goal is that this tintype – 90 percent will believe it’s Crazy Horse,” he affirms. Thompson points out a major problem has been the flat pronouncement of historical writer Mari Sandoz, in her 1942-published biography “Crazy Horse: The Strange Man of the Oglala,” that “(t)here never was a photograph taken or a likeness made from firsthand witness of Crazy Horse.” Little reason seemed to exist to doubt her. The portrait is what’s known as a quarter tintype, 2.5-by-3.5 inches and one of four images on a plate, and was taken at Fort Robinson, in the summer of 1877, Crazy Horse’s 35th and final year. And its first owner was Baptiste (Little Bat) Garnier, a highly regarded Army scout of French and Sioux parentage who was considered to be a good and trusted friend of Crazy Horse. It’s presumed Little Bat persuaded the chief to have his picture taken with assurance that it would be kept secret while he still was alive. “Writers have used this incident to prove that Crazy Horse never allowed his photograph to be taken, but this, of course, is ridiculous,” McLoughlin said in a footnote. When Little Bat was murdered in 1900 at Crawford, Neb., near Fort Robinson by James Haguewood, the tintype became the possession of his wife, Julie Mousseau, a second cousin of Crazy Horse. Upon her death, it went to her daughter, Ella, who became known as Mrs. Ellen Howard. When acquired by Fred Hackett, it was accompanied by a signed letter from Mrs. Howard, witnessed by Hackett and C. Bear Robe, attesting to the tintype’s authenticity. And, while dispute hung around the image in the aftermath of these publications, Abiuso, the historical sleuth, was instrumental in unearthing the original tintype and Howard letter in the effects of Friswold’s estate. Thompson says they were bought at Butterfield Auctions in 2000 by a woman who wanted to make sure they would find a good museum home, and a tip from a friend made it possible for the Big Horn County man to buy them and bring them to the local battlefield where Crazy Horse was instrumental in Custer’s demise on June 25, 1876. The curator figures the controversy over the image will make the tintype all the more a focus of curiosity for history buffs and a drawing card for tourist interest and visitation. He plans to have posters and postcards of the image available for sale by this year’s June 25 anniversary at the museum’s shop and his Custer Battlefield.Trading Post & Café at Crow Agency. Over the years, he made seven trips to Montana, the Dakotas, Nebraska and Wyoming, spending a great deal of time to study all available museum and archival data for evidence about Crazy Horse’s appearance, clothing, personal articles and telltale facial scar from a bullet wound. He can take you through the fine details about the figure in the tintype and show how they match historical descriptions about Crazy Horse. Much of the testimonial comes from Chips, the medicine man to whom Crazy Horse turned for his battle medicine, and is included in the Judge Eli Ricker collection at Nebraska State Historical Society archives. 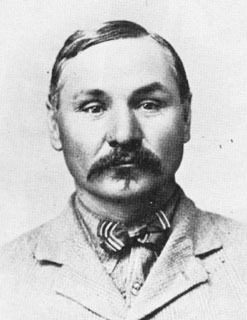 Chips described the chief’s medicine as including two bilateral and matched tail feathers of the spotted eagle and how one was worn upside down in his loose, light hair while the other was laced to a rawhide skin that covered a black stone at the end of Crazy Horse’s medicine lanyard hanging over the bottom of his shirt. “That’s exactly the way the tintype looks,” notes Abiuso, who observes each warrior’s medicine to protect them in battle was unique to them. As for the other main proof, although nay sayers for years have said they don’t see a scar, the modern technological capabilities of high-resolution scanning have brought it into an undeniable focus, the sleuth says. At age 26, Crazy Horse had woman trouble, stealing Black Buffalo Woman from husband No Water, who wasn’t about to let it go. No Water borrowed a small-caliber hand-hidden pistol, apparently loaded with only a half-charge unbeknownst to the plotter. When he discharged it at Crazy Horse’s face, the ball entered on the left side below his nose, following a path along the facial bone too high to knock out any teeth, and exited ahead of his ear. The scar left no prominent marks on his already light complexion (his reputation was as “the light-skinned warrior”). He concedes it’s understandable critics could not see the scar in the small tintype or earlier reproductions but that’s it’s discernible now, in an enlarged image of the face in a high-resolution scanned photograph by Scott Burgan of Sheridan, Wyo. More confusion stems from tintypes being positive prints, the same way a person looks at himself in the mirror and sees his right arm as if it were his left arm reflecting back. That’s reverse from modern photography, where you see your right arm on the left side in a picture staring back. So, while it appears Crazy Horse is holding his prized red blanket over his right arm in the tintype, he really had it over his left arm, the same side as the scar starting above his lip. A critic seeing no scar on the right side in the tintype would be forgetting it is not a modern photograph where subjects are flipped laterally as they go from negative to positive. On the Internet, the image can be viewed both as the original mirror-image tintype and also in a linked enlargement laterally flipped to present it in the more-familiar orientation of today, with colorization using latest computer techniques and months of forensic research to present a true image, says the web site (www.stringofbeads.com) of Richard Jepperson of West Jordan, Utah, who died very recently. His nephew, Doug Jepperson, continues to work with Thompson on designing the planned poster and postcard. From eyewitness descriptions, it’s known Crazy Horse was five feet, eight inches, tall, lithe and sinewy of body, with a lean face and thin, sharp nose. He carried a quiet dignity with a countenance described as morose as well as dogged. 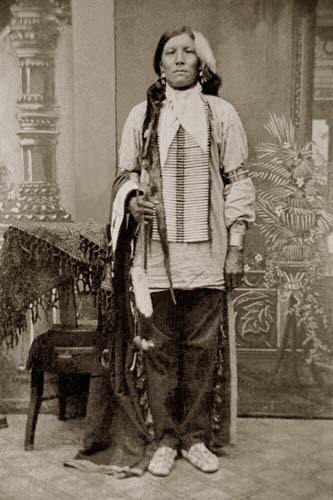 He typically wore a white muslin shirt and dark blue cloth leggings, both unusual attire for Indians of his period, but clearly showing in the tintype. Abiuso says he was wearing the same white cotton jersey when he was killed. The researcher also attaches importance that the warrior in the image is light-skinned and had unusually loose-hanging hair, with the single feather dangling, as well as his long braids being wrapped in otter fur almost the color of his hair – all as did Crazy Horse. Even if penetrating in his gaze, the Indian in the image is in what would be regarded as a peace pose, without the full battle dress and fierce look while holding a favorite weapon that chiefs usually brought to a photo opportunity. Abiuso sees this as further proof the man is Crazy Horse. The chief also is holding in the image his favored chief’s blanket that he got in 1867. Abiuso notes he would make sure his blanket would be properly presented, touching perfectly to the floor, in agreeing to have his picture taken. Mari Sandoz also referred to Crazy Horse carrying his red blanket folded over his arm as he walked unwittingly to the guardhouse, where he was bayoneted. Even though fatally wounded Crazy Horse is part of the mystery mystique that clings to the chief and many Old West happenings. Some accounts refer to an infantry captain named Kennington. The late Jepperson notes historians have written hundreds of pages about his killing and that it was an event closely witnessed by “perhaps” 50 individuals. Gentles, a 22-year military veteran, only survived Crazy Horse by about nine months, when “asthma” at Camp Douglas, Utah Territory, got him. A letter written many years later (1927) by Dr. McGillycuddy describes Kennington escorting Crazy Horse to the guard house, a howl from the chief as he jumped out the door again and a pass at Kennington with the chief’s long knife. As Kennington and Little Big Man caught hold of him, Crazy Horse slashed the Indian across one wrist, freeing himself, only to find a double guard of 20 men close around him with fixed bayonets. Another Indian present, Chief He Dog, left an account that Crazy Horse was inflicted with two wounds, one on the left side of his back and a smaller, deeper wound a little below it. He apparently left no identification of who inflicted the wounds but said the chief jerked free of the lunge and that Gentles missed, his bayonet going into the jailhouse door jamb. “You can see the slashes in the wood,” offered He Dog. The official Army position couched the death as an accident, that Gentles pointed his bayoneted rifle at Crazy Horse to force him back to the jail, with the chief falling on the blade in a struggle. Crazy Horse was a major leader in a number of strikes against the invading whites, including leading the Oglalas in the 1886 massacre of Captain William Fetterman and 81 officers and men outside of Fort Phil Kearny in Wyoming. When Sioux Chief Red Cloud signed the Treaty of 1868 that terminated that fort and two others, closing the Bozeman Trail, Crazy Horse was one of the two principal chiefs who never accepted the deal. He hooked up with the Uncpapa Sioux and the great medicine man Sitting Bull and was a leader of the hostiles who declined to stay on reservations for lifestyles designed by the whites. When Crazy Horse, Sitting Bull and their warriors were on their way to the great encampment on the Little Bighorn in 1876, the punitive expedition of General George Crook ran into them in a surprise encounter that blossomed into the no-clear-victor Battle of the Rosebud. Days later came the Big Fight on the Greasy Grass, as the Indians call it. The hostiles apparently were aware of the approaching Custer force, although they may have been surprised by the diversion provided by the Major Marcus Reno detachment coming from the south along the river. Crow King led several hundred of his fellow-Sioux across the river up the gully to the south soon after Custer’s command was seen on the bluffs. But the main body of the Oglalas and Cheyennes moved downstream until they reached a ford near the Cheyenne camp circle. The chief moved his warriors across the river and up a long coulee going east until it passes Battle Ridge, following it to the right and then a southerly direction around to the east and southeast, meeting the coulee up which Crow King’s band had traveled. Another group followed Crazy Horse but turned southward to a position between the ridge and river, presently the site of the battlefield cemetery. Others crossed and moved up various ravines and gullies so that Custer’s soldiers could be attacked from all directions. As the battle developed, a flanking move by Crazy Horse’s hostiles was thought to have made impossible any further advance by Custer and his surviving men toward the top of the ridge, as “the troopers prepared to sell their lives as dearly as possible,” wrote Stewart. After his murder, Crazy Horse was given the traditional tree-scaffold burial on Beaver Creek, a short distance from Fort Robinson. Sioux traditionalists still go there to pray and smoke their pipes. All that’s left of the heroic Crazy Horse are the historical descriptions of his contemporaries and apparently a sole tintype that matches the descriptions, now at home at the famed battlefield. Curator Thompson says its unveiling at the museum will be only a first step. He sees possibilities for further studies focusing on the debates over the tintype. “We might even do a seminar on it,” he offers. Thompson recalls his first chilling moment after obtaining the portrait – the time he showed it to his friends, Oglala Sioux artist Ed Two Bulls and his wife, Lovey, descendants of the great chief. He says he figured they would be quite dubious about the tintype being Crazy Horse. First engaging them in conversation, he asked what they thought about the story that the chief was afraid of what cameras might do to him and thus rejected ever having a photograph taken. “He wasn’t scared of a camera. He wasn’t scared of anything, “ the curator reports the couple told him. Then, Thompson drew the treasured portrait from its protective sleeve and showed it to them. “It’s him! It’s him!” he says they both exclaimed. “That’s the first time the hair stood up on my neck,” Thompson relates. Stare into the tintype’s riveting, penetrating eyes, and make your own determination if it is Crazy Horse who has bridged more than a century to bring you the murderous chill you feel.